Read our Antagut review below. 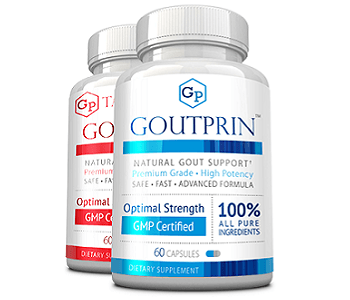 The manufacturer, Fuma Natural, claims that this product balances and supports healthy uric-acid metabolism, leading to gout-free, and healthy joints. When uric acid levels are balanced, uric-acid crystals, linked to the development of gout, are not easily formed In addition, it is claimed that this product is able to assist with dissolving uric-acid crystals. The ingredients in this formula are morinda, eclipta, alisma, prunella, and berberine. The herb alisma assists with strengthening water metabolism: this process helps the body eliminate surplus fluid through the urinary tract. More so, this herb may be used as a tonic to stimulate fluid functioning. The herb eclipta is used as an antifungal agent against liver cirrhosis, and hepatitis. Morinda enhances sexual performance in both men and women, but also reduces lower-back pain. Prunella is useful in controlling inflammation in the eye, and reducing swelling. The recommended dosage is three (3) capsules, twice daily, a total of six (6) capsules daily, alternatively, as prescribed by your doctor. However, the manufacturer fails to inform the end-user whether the second dose should be taken afternoons or evenings, and whether the capsules should be taking with food, or on an empty stomach. 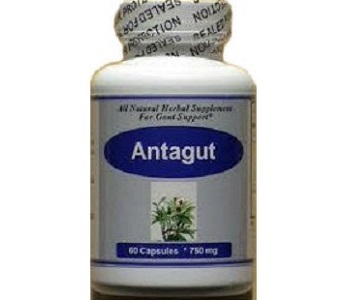 One bottle of Antagut, containing 60 capsules, is available online direct from the manufacturer for $19.50. This a discounted price. The original price was $24.95. No bulk deals are offered. Prices exclude shipping fee. The manufacturer offers a three-month money-back guarantee, if the bottles are not opened. A buyer may return one (1) opened bottle in that period and still receive a refund, however, other opened bottles will not attract a refund. The consumer is responsible for the shipping fee and a handling fee. If the consumer refuses to pay the shipping fee, he or she would be subject to a 15% restocking charge, as well as the handing fee. Despite our research efforts, we were unable to locate any reviews from the end-users on this product. Antagut seems a useful dietary supplement, all-natural, made from herbs, to treat the process of gout by controlling uric-acid levels and the build-up of uric-acid crystals. This product is sold at a discounted rate, and backed by a 3-month guarantee. However, there are also some problems a buyer should be aware of. A bottle of 60 capsules, at six (6) capsules daily, will last only 10 days. Three bottles are therefore needed for a month’s supply. This company does not offer package deals in which one can buy in bulk and save. Additionally, reviews are absent. Reviews are useful for a buyer to learn the experience others have had of this product, the short- and long-term benefits, as well as side effects. Lastly, the dosage instructions are just too vague – they do not inform the consumer sufficiently to ensure that the end-user receives the best results. As such, it might be better to rather select a better quality product. There are so many good products on the market that can offer much better results.